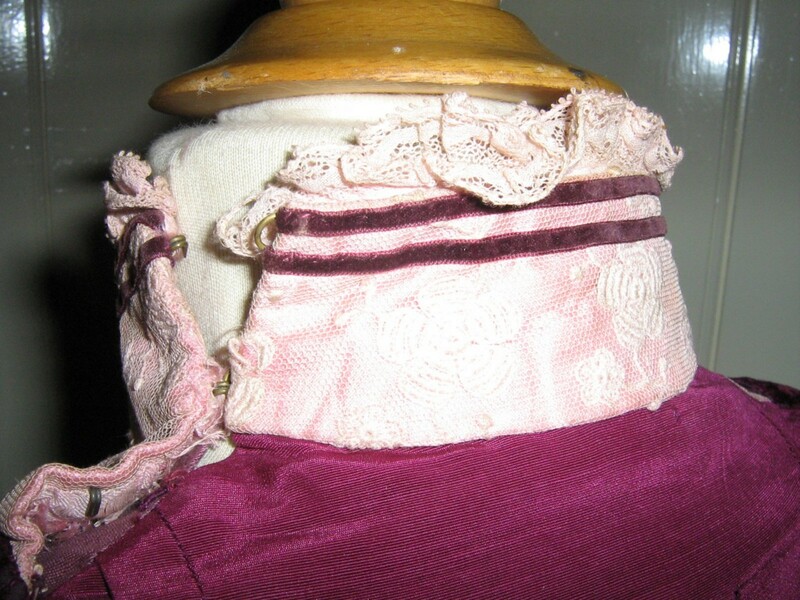 Sweet little late Victorian or Edwardian bodice which has had quite a life! 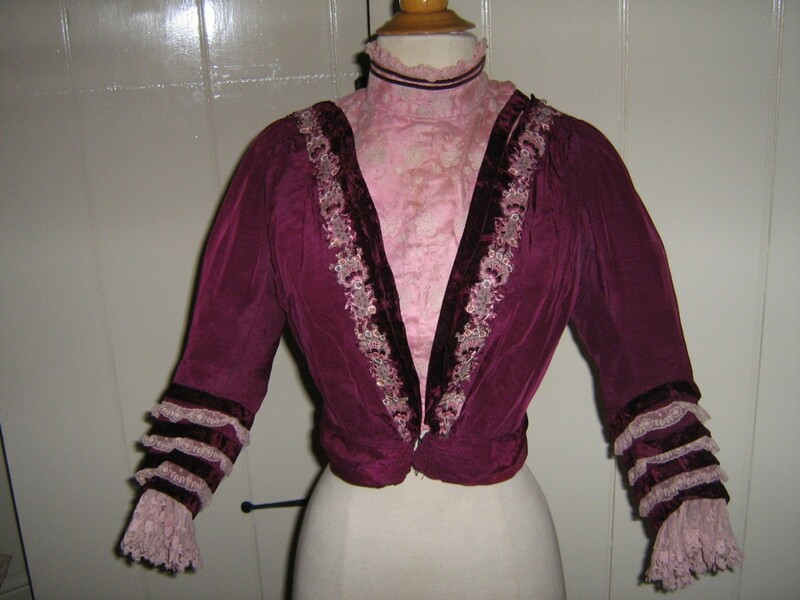 She is perfectly wearable and very pretty, but is better for re-enactments and fairs, rather than for the collector. 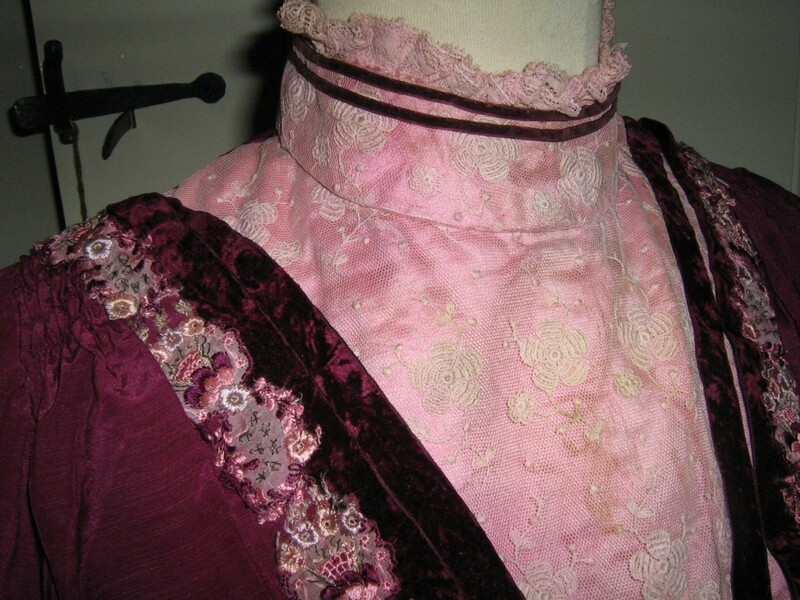 Her main features are a lovely soft flowing silk in a vibrant pink-purple colour, with lots of lace and embroidered braid to the front. Fully lined in cotton, with bones and a strong inner waist band. At first one thinks how unusual it is to see pink lace - sadly no. 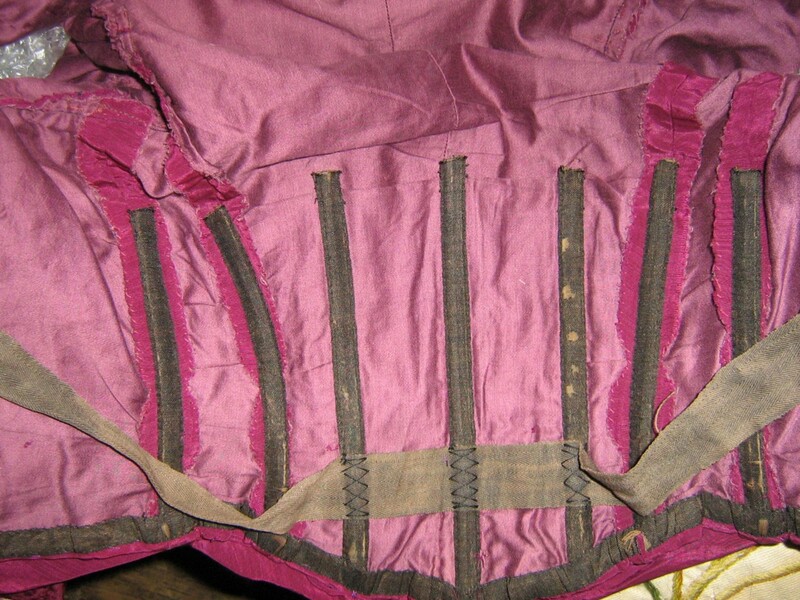 I'm sure the bodice was washed by some chump and the purple silk dye has run into the lace. At least it is evenly dyed and not blotchy! 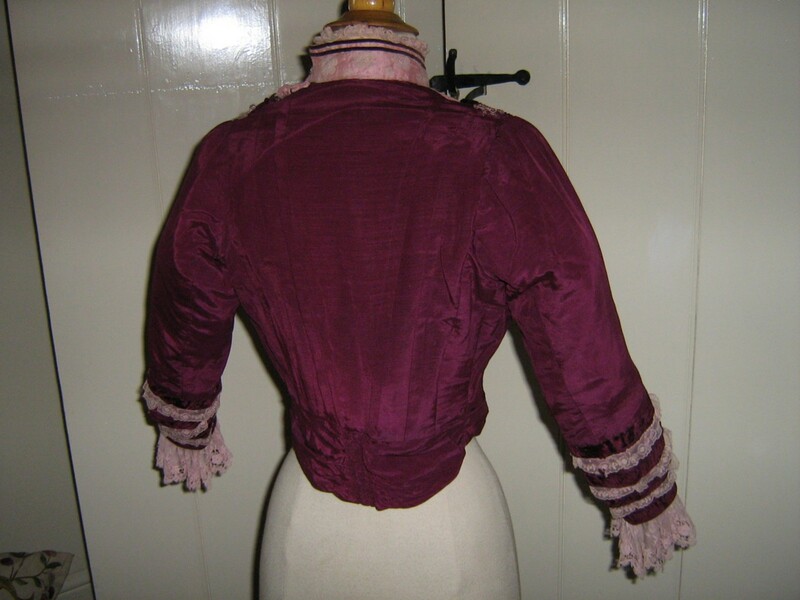 Washing it does not appear to have harmed the exterior silk, but it did harm the lining to the collar and inner front which would have been thinner silk. This is shattered so appears messy - obviously not on sight when worn. Both underarms are patched in a not very nice way, but at least very securely. There is also a poorly repaired tear just in front of one underarm. I am sending some modern but nice quality ribbon so you can make a bow or otherwise cover these repairs. 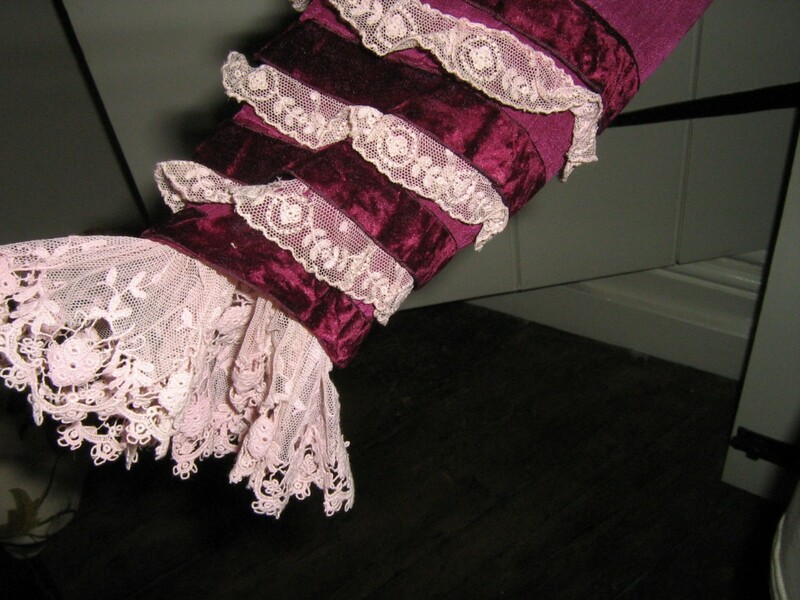 The sleeves are otherwise very pretty, with their bands of velvet and lace, leading to flounced lace cuffs. One sleeve has a pale mark which is not large but does show. The embroidered braiding is worn but still looks nice as long as no-one looks too closely! 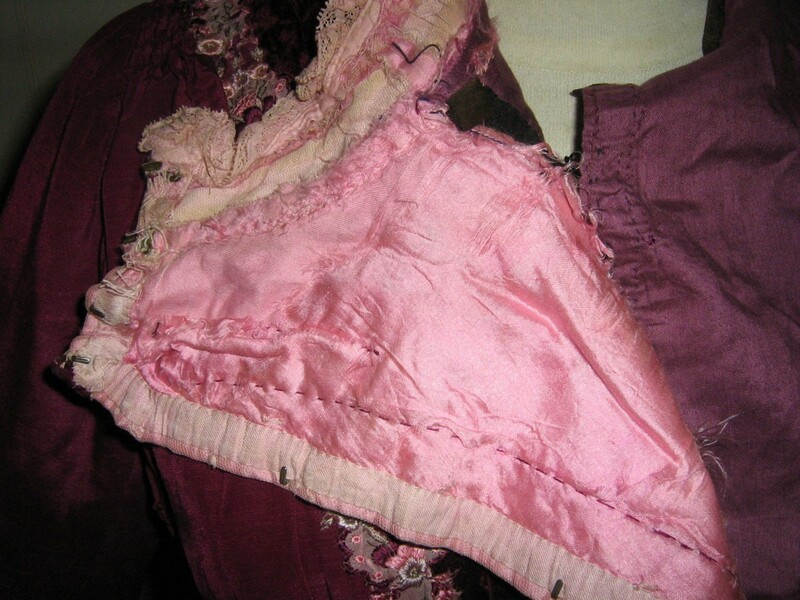 The lace is all good, but the front panel lace covers two mild stains to the underfabric. Cover these with a pretty brooch! The ruched cumberbund is fine, as is the tucked back. 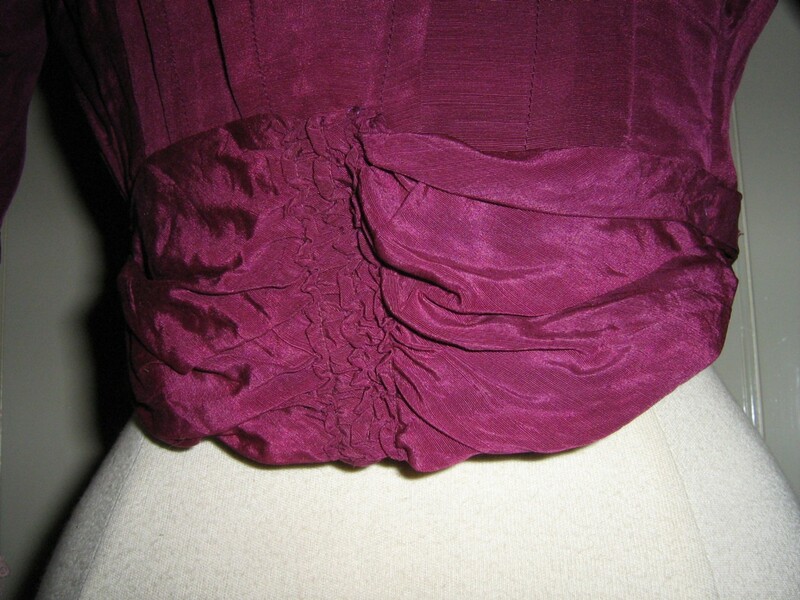 So, a wearable, pretty antique bodice which is a bit the worse for wear! Shown on a mannequin with 33" chest and 23" waist, there is a little space so could fit slightly bigger, but you will need a slim neck! I am listing a delightful little lace bonnet that matches this beautifully. Do have a look at it!